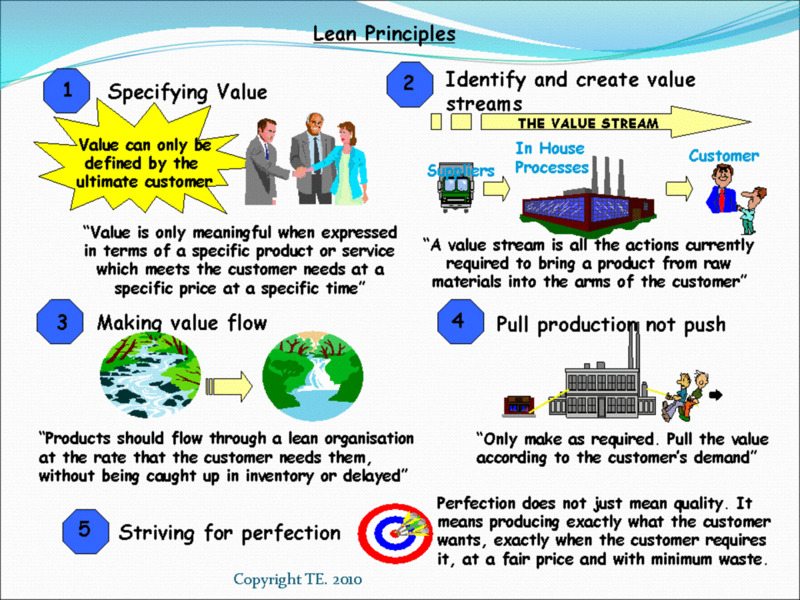 When most people think of lean manufacturing they think only of waste reduction through the elimination of the seven wastes or the seven Muda, Muda being the Japanese term used by Toyota to signify a non-value adding process or waste. Muda is only part of the story, but it is the one that most people focus on because it is the easiest to recognize and tackle. Toyota use three Japanese “Mu” words as part of the Toyota Production System (TPS): Muda, Mura, and Muri. Each of these is a type of waste and instantly recognized by the Japanese as part of a business improvement initiative! 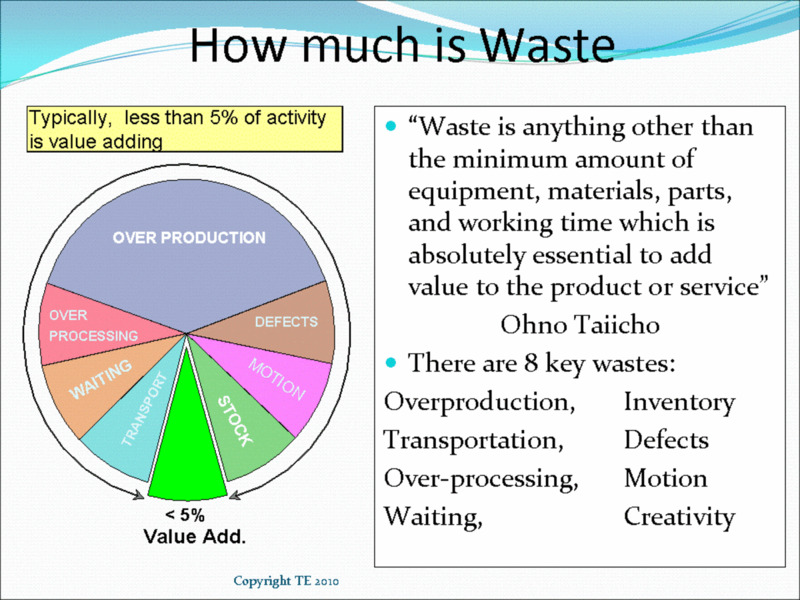 Eliminating waste is the way to reduce your costs and hence improve profit; this is one of the aims of lean manufacturing. 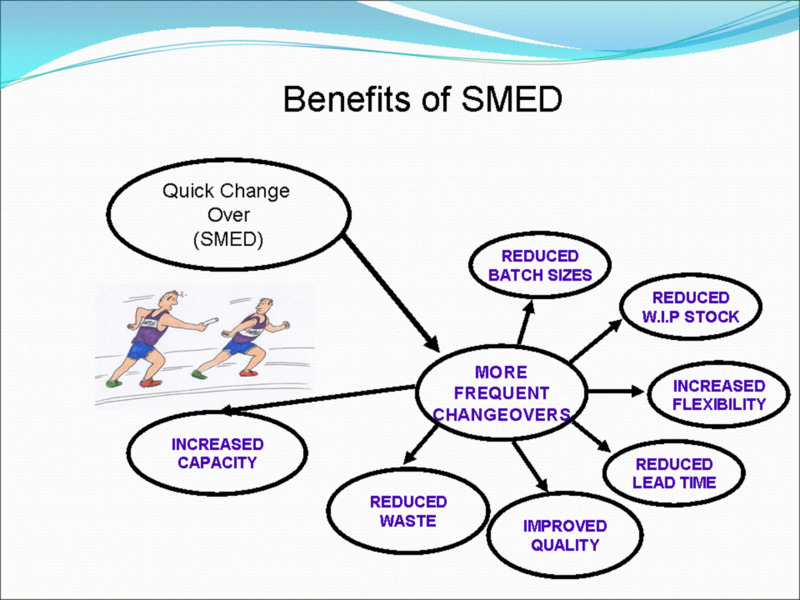 The benefits of lean manufacturing can be very significant if implemented correctly and sustainably. 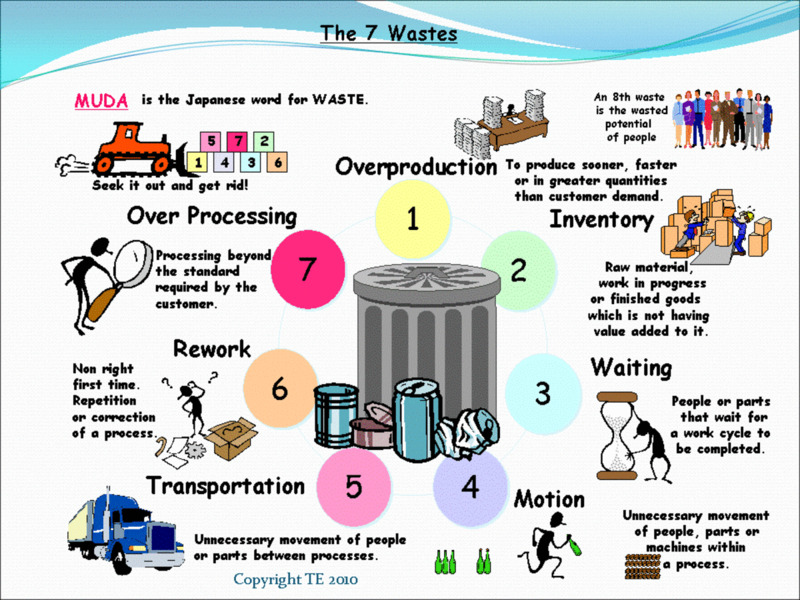 Muda or the 7 wastes as I have already said are non-value adding processes or actions, any process that does that does not directly modify the product or service in a way that the customer is willing to pay for should be considered as non-value adding and thus muda. Mura is defined as unevenness, a lack of stability and flow. 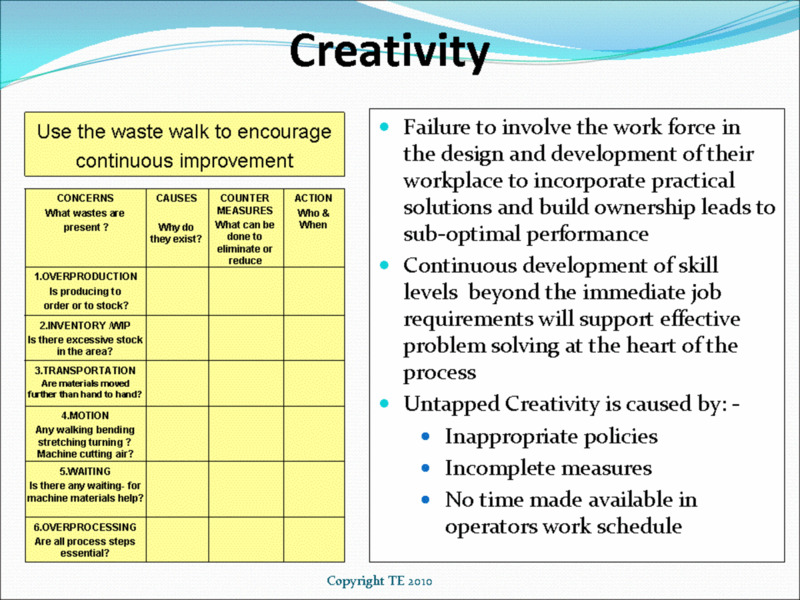 This unevenness drives the creation of Muda and the 7 wastes (non-value adding activities) and should be tackled through the application of Just in Time principles. 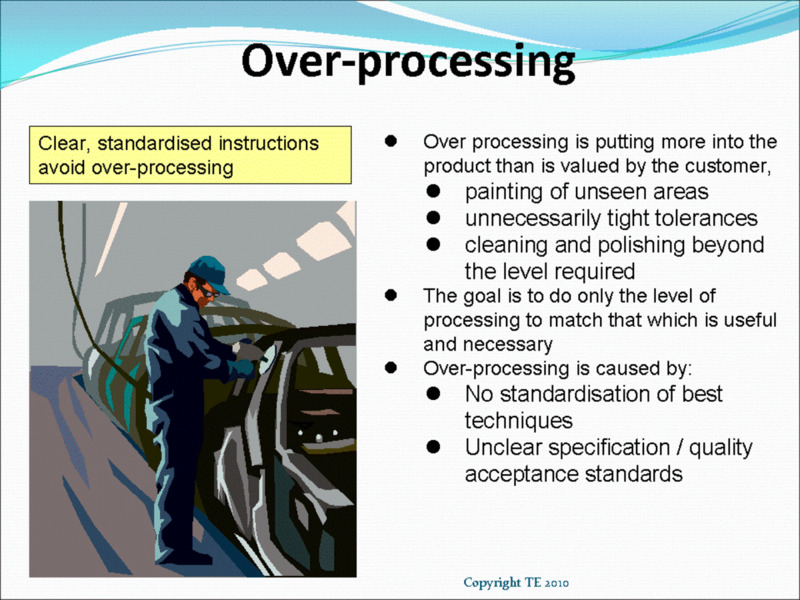 Muri is overburden: expecting an operator to perform without a clearly defined process, expecting too much, and not having the right tools and skills are all examples of overburden. Again Muri drives the creation of Muda and needs to be tackled through initiatives such as 5S which will help to introduce standardized work processes. All of these three categories of waste cost the business money. 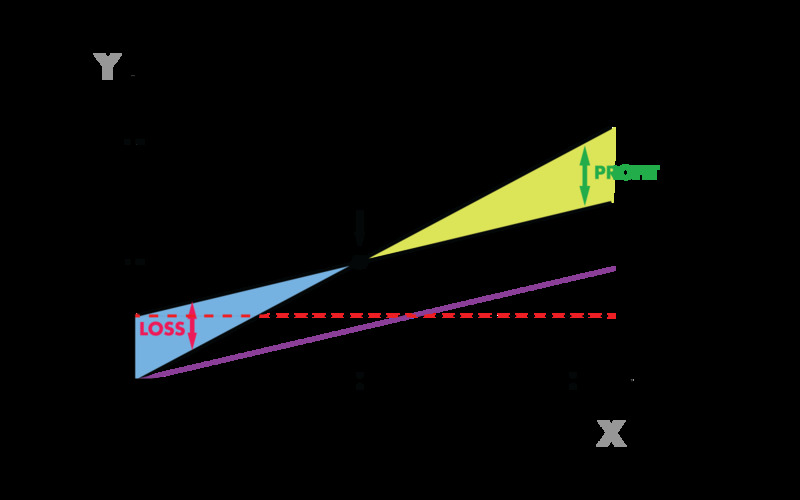 The overall aim of any business improvement technique, be it TPS, Lean manufacturing, Six Sigma or any other, is to improve the profitability of the business; make more money! To do this however we have to be able to recognize these wastes for what they are and be able to tackle the root causes that cause them to cost our businesses so much! 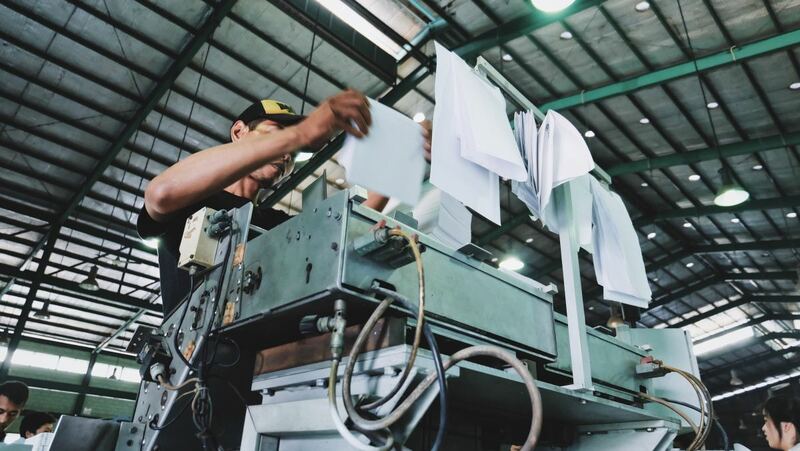 Most definitions of lean manufacturing in the west refer to the reduction of the 7 wastes as the main aim of lean manufacturing, however few definitions of lean differentiate between the different types of waste and seem to purely focus on Muda. TPS however sees waste as being all three, Muda, Mura and Muri, something that many lean practitioners here in the west seem to have forgotten. Whilst focusing on the 7 Mudas can make some highly significant savings we tend to fail to see the big picture and make inappropriate processes and products more and more “efficient”, removing time and cost, but not in a sustainable manner. Because we fail to see the Mura and Muri within our systems we start to put Muda back into the processes. We fail to tackle for instance the unevenness (Mura) in our demand, and sales try to offer promotions to sell more products, this creates higher demand in a short space of time requiring the process to have to change to meet this demand, often through increases in inventory, and other wastes that undo the improvements made in the processes when focusing purely on eliminating Muda. Mura can be tackled through implementing the philosophy of Just In Time (JIT). I have heard arguments that to tackle Muda automatically causes you to tackle the Mura and Muri in the system, to some extent this is correct, tackling a problem and using the 5 whys to get to root cause should get you to the Mura and Muri in the system, however without a holistic view of the whole system they are often overlooked or not even recognized as the causes by inexperienced practitioners. Most people will agree that the best way to tackle a problem is to remove the root cause, therefore in my mind the focus of any waste reduction program should be on removing both Mura and Muri, this will automatically remove much of the Muda (seven wastes) in the workplace. 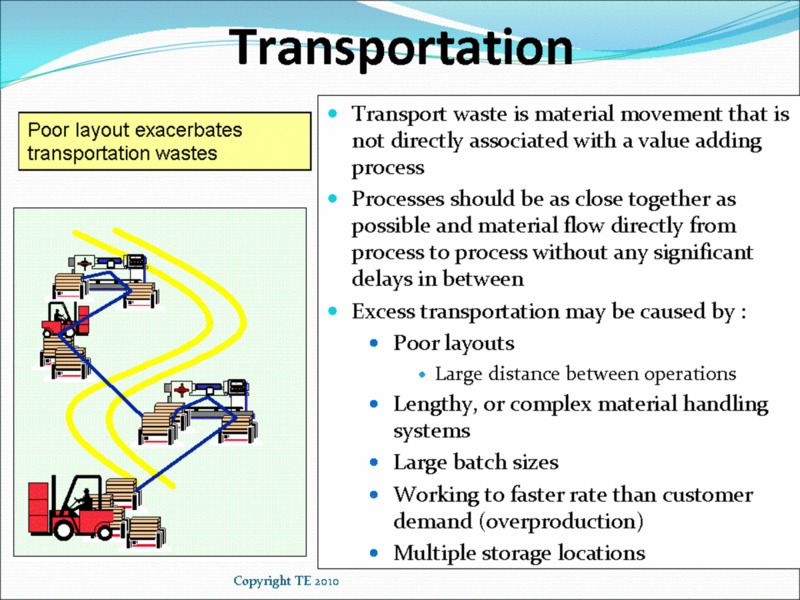 TPS splits Muda into seven wastes, although over the years many have been added. But basically any action that does not physically change the shape of the product or service and can be done at a more economical rate or with less resource should be considered as being one of the seven wastes! Studies done many times over show that in most industries less than 5% of actions are value adding, 95% of what we do is not adding value to the product and is a cost to the business. The seven wastes or Muda can be remembered through the use of either of two mnemonics: "TIMWOOD" or "WORMPIT." A short definition of each of the seven follows below. For an in-depth explanation of each waste read my seven wastes article. Transport. The movement of product and components between locations, this costs you money but adds no value to the product. Having different processes located together can help eliminate transport costs and eliminate potentially hazardous and dangerous movement of stock using forklifts and other vehicles. Inventory. 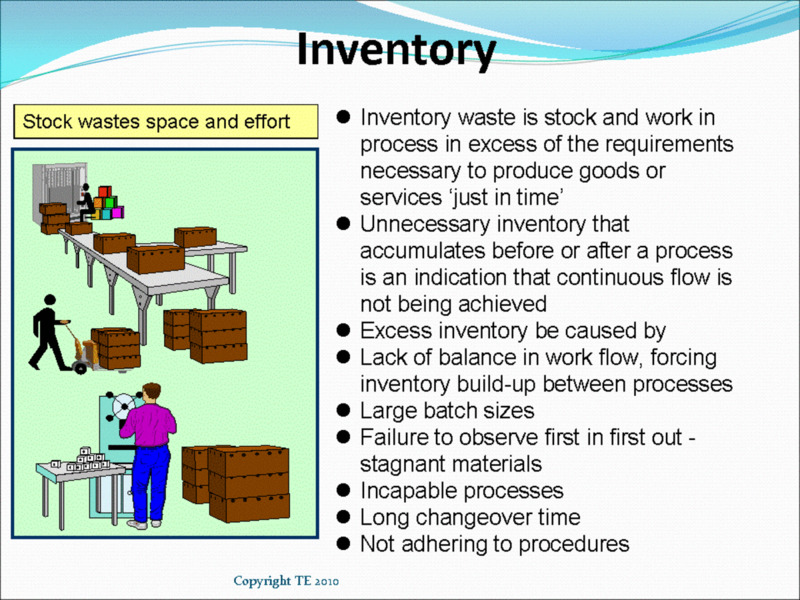 Inventory is a buffer used to hide all of the problems in your system, it insulates you from supplier failure, poor scheduling, breakdowns, poor quality and many other problems. In addition inventory requires space, transporting and ties up your cash. How much cash could you free in your business if you released just half of your inventory? Motion. 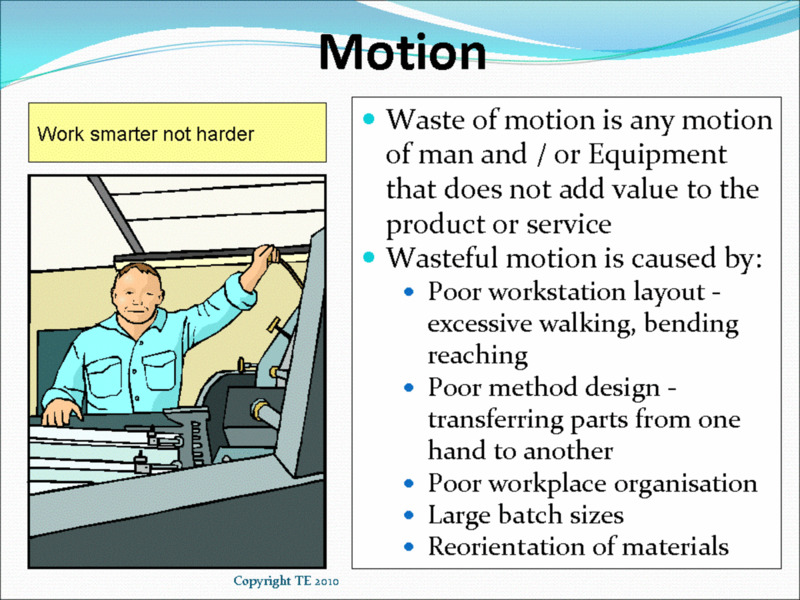 Any movement within the workspace that cannot be done more ergonomically or efficiently, such as picking heavy objects up from floor level to a bench or other working area. This is different from transport as it is the movement of the person (or machine) within the actual process. Waiting. Exactly that, waiting for machines, people, information, product and so on. You would be surprised how much time people will spend just waiting; consider more than just production processes. 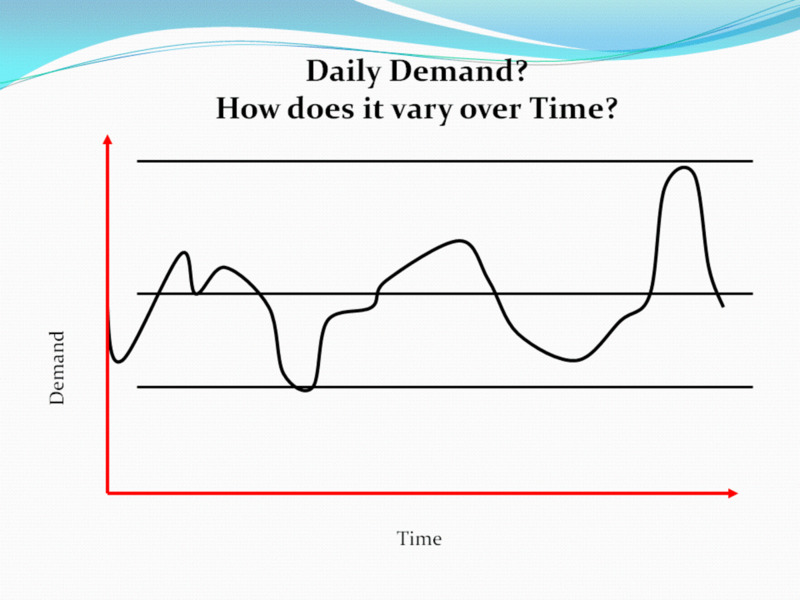 How much time does your production spend waiting for an order to be processed before they start working on it? 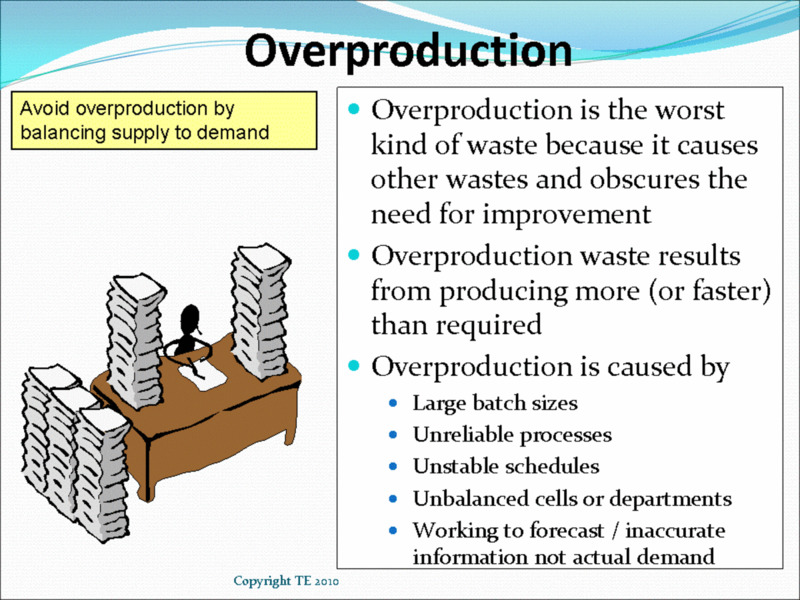 Overproduction. Creating more that the customer needs or sooner that the customer needs it thus leading to inventory. We often create more than we need to buffer potential problems later or to make use of economical batch sizes within our process. Over-processing. Doing more to the product than is required by the customer such as over specifying tolerances causing slower more expensive processes to be utilized. Defects or Rejects. 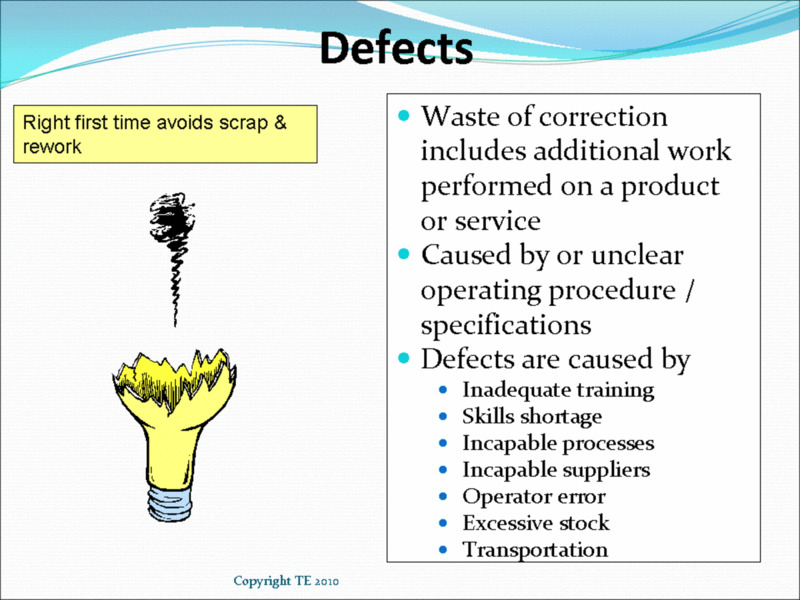 Probably the first thing that comes to mind when someone says waste in an industrial setting, the costs of defects is usually a factor of ten greater than just the material costs involved. Talent. 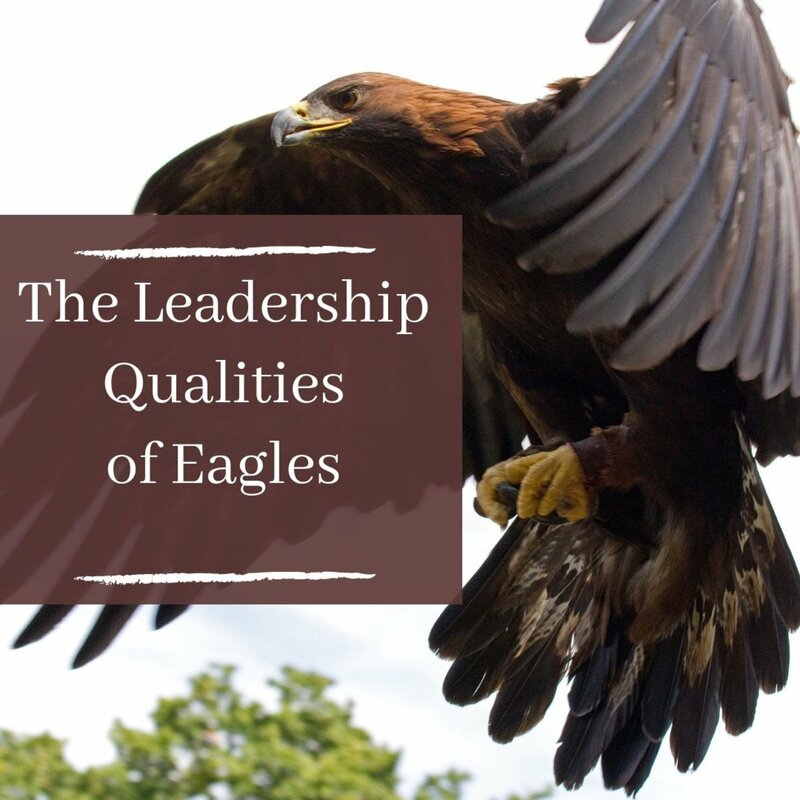 Failure to utilize the people in your organization. By-Products. Not using the “waste” from your processes to good effect such as recovering heat from machine cooling systems to heat the office. Resources. Not efficiently using the resources available to you, such as turning off machines when not in use, using more efficient pumps etc. 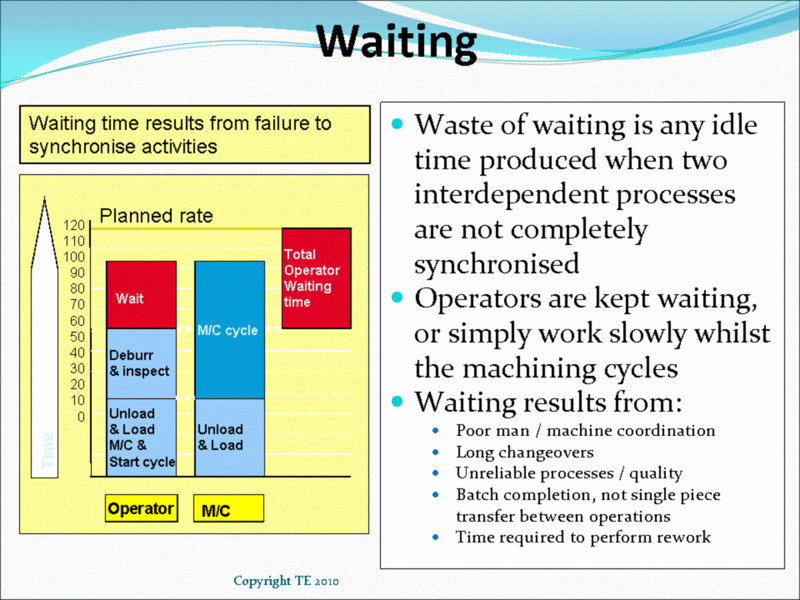 These Links will help you to find more information regarding implementing Just in Time (JIT), Heijunka, and removing Muda (7 Wastes), Mura, and Muri to help you improve your business by implementing lean manufacturing.